I've added mine to this blog, it's on the right sidebar, it does take a while to load so I've decided to just include fans without the stream. Or you can exclude both and just have a linking button. 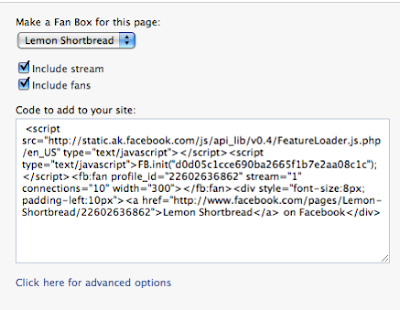 For those who wants to create a Facebook page, sign into your Facebook account and visit any page you come across. Scroll to the bottom. 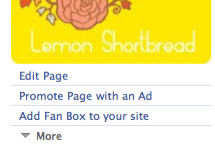 You will see a 'Create a page for my business' link on the left sidebar. It's tiny but it's there! A facebook page is useful for sending updates to your fans, and includes albums which you can share to non-facebook audiences. Just stopped by to say have left a little award for you on my site. Additionally, am also your newest follower! Terrific post as always! Love your work! What a great tip. Thanks for sharing great info!!! Thank you for the great tip. So happy when someone shows me what to do..half of the time, I get lost. My problem, I don't take the time to read things through. So pleased you like the award - so well-deserved & really appropriate given your lovely title!! Have a wonderful weekend & see you again soon! I have been wanting to do this! I just need to figure out how to make a widget for my store! p.s. Your illustrations are very cool!